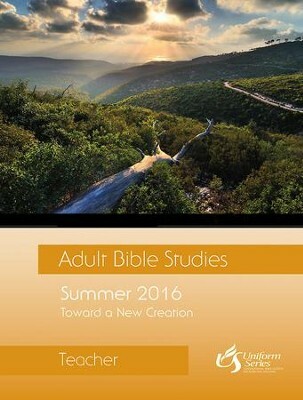 This summer, lessons in Adult Bible Studies follow the theme, "Toward a New Creation." The student book writer is Clara Welch; Mark Price is the writer for the teacher book. The quarters first four lessons deal with the concept of the day of the Lord, the consequences of disobedience, assurances and joy for the faithful, and the consequences of ignoring Gods truth. Scriptures come from Genesis, Zephaniah, Psalm 8, and Romans 1. The first lesson in this unit leads us to consider Gods truth within us, while the second lesson reminds us of sins power. The third lesson celebrates that God has set things right, while the next lesson reminds us that we are not without hope. Scriptures come from the Book of Romans. The five lessons that conclude this quarters study lead us to discover how death becomes life, how we are safe in Gods love, what it means to live under Gods mercy, how God prunes and grafts us into Gods family, and how love fulfills the law. Scriptures again come from the Book of Romans. The free Current Events Supplement offers a way to connect each weeks lesson to a timely event or topic in the news. The supplements can enhance all resources using the Uniform Series. As a Christian educator and pastor, Mark Price has spent most of the last twenty-five years teaching and studying the Bible within the context of congregational ministry. He has served in various-sized churches in Georgia, Kentucky, Virginia, and most recently Tennessee, where he is presently the Minister for Spiritual Formation on staff at Christ United Methodist Church in Franklin. From 1999-2009, Mark worked for The United Methodist Publishing House as part of the editorial team responsible for the DISICIPLE Bible study program. In that role, he supervised the revision of the foundational DISCIPLE: Become Disciples Through Bible Study course and conceived and developed six studies in the Short-Term DISCIPLE series. All of Mark's work and ministry is shaped and supported by his family--his wife, Marne', and his two children, Kathryn and Chris--and his particular grab bag of skills and interests. I'm the author/artist and I want to review Adult Bible Studies Summer 2016 Teacher - eBook.